CanGlide Inc. is a New Brunswick company incorporated in 2002 for the purpose of designing, manufacturing and marketing an innovative product called the Slidler™ used in industries with trough conveyor systems. The Company, based in Bathurst, New Brunswick was founded and is owned and operated by Ian Oliver, president and Jean-Marc Boudreau, vice-president and inventor of the Slidler™. Mr. Boudreau is credited with developing a method using smooth surfaced pads for safely and efficiently moving the large structural components of the Confederation Bridge, from the staging area to the erection barge, and on to the bridge site. 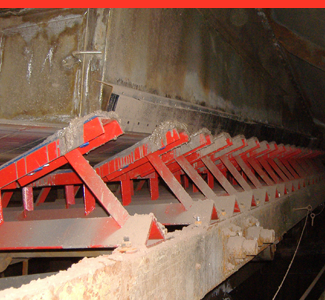 The Slidler™ is an improvement on the idler system, and consists of smooth surfaced cartridges, or pads, attached with a patented fastening system to a frame to replace idlers in existing conveyor installations. It is safer than the idler and has lower maintenance costs. The Slidler™ has been successfully implemented in a variety of industries in Atlantic Canada and the product is now being introduced in Quebec and Ontario. Contact a Canglide sales representative now to improve your conveyor systems. The Slidler™ in action. This slidler has been in service for three years without requiring any maintenance whatsoever. Slidlers™ are very easy to maintain, replacing a Slidler is a quick process that requires no tools.